1. Mix all the marinade ingredients in a pan. 2. Simmer over low flame until sugar dissolves. 3. Keep aside to cool and pour over the chicken strips. 4. Cover and keep them in the fridge for 45 minutes. 5. Heat 1/2 tblsp oil in a pan over medium flame. 6. Fry the marinated chicken until cooked. 7. Heat the remaining oil in another flat non-stick pan. 8. When it starts to smoke, add the chicken pieces and switch off the flame. 9. Transfer to a plate and garnish with spring onions. 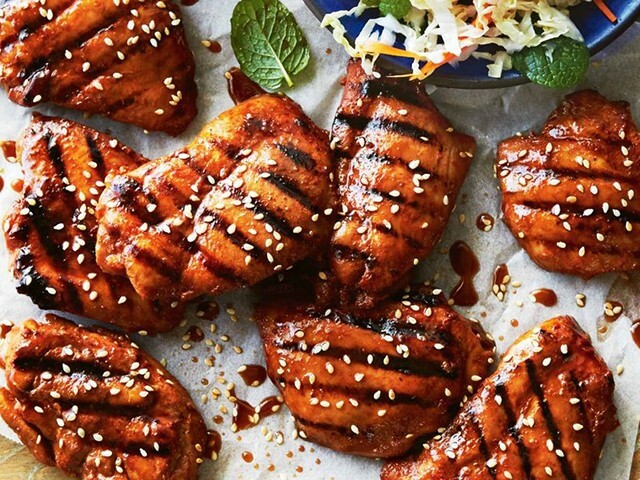 Feel free to comment or share your thoughts on this Korean Chicken Barbecue Recipe from Awesome Cuisine.